A Peek at Bitonti’s New Skins Workshop #WearableWednesday « Adafruit Industries – Makers, hackers, artists, designers and engineers! We’ve covered Francis Bitonti’s amazing 3D printed fashions on our blog before, so I was super excited to find Rain Ashford’s blog post on Bitonti’s New Skins Workshop held in London. Rain is doing her PhD research on the use of wearables as a new form of non-verbal communication, so it is no surprise that she would be up for this 3D adventure. The workshop was focused on designing 3D textile meshes using Autodesk Maya and Rhino 3D. Here’s Rain’s report on week one. Our first week started off by creating meshes for the body in skirt and shirt like forms in Rhino 3D. 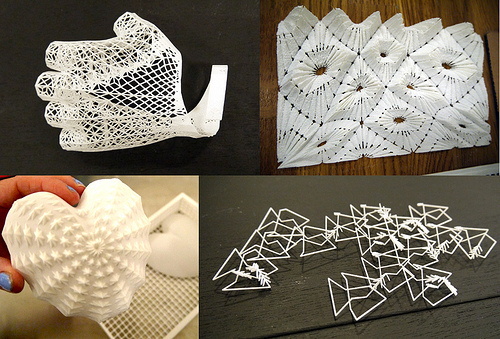 We then experimented with various mesh techniques to apply varied distributions of extruded geometric shapes on to a mesh. 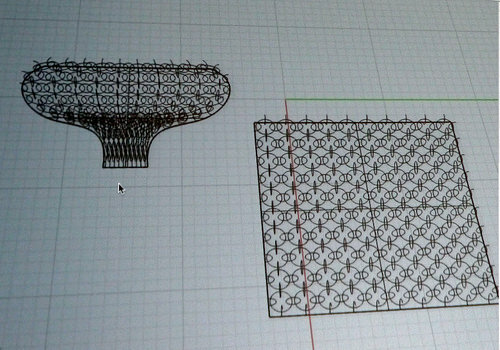 Going on to concentrate on creating interlocking aspects of a circle, we created a repeated template that could be used to create chainmail in Rhino 3D. The makers then had a chance to experiment with primitive polygon shapes to create mesh, which led to creating their own original designs. 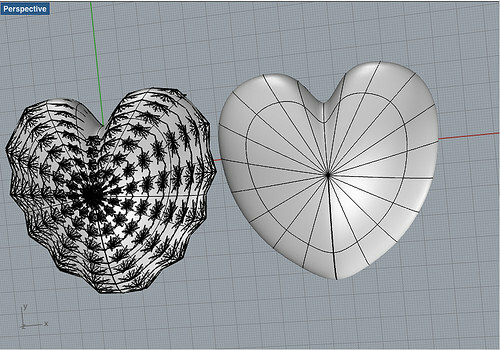 Rain was captivated by a shell texture and developed files for a heart shaped piece. Every .STL file was checked over and fixed in Materialise’s very useful app, Magics (which I wish I could afford for future work! 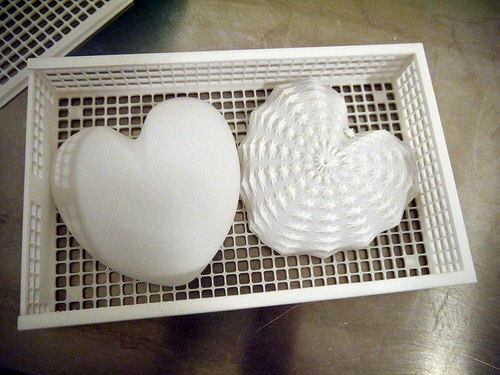 ), before sending to the SLS (Selective Laser Sintering) machine to be turned into real objects via the magic of a laser zapping powdered nylon. The printed pieces are done in baskets, and they look like magic when they come out of the machine. I should mention that Rain’s work often uses sensors and has a flair of magic itself. 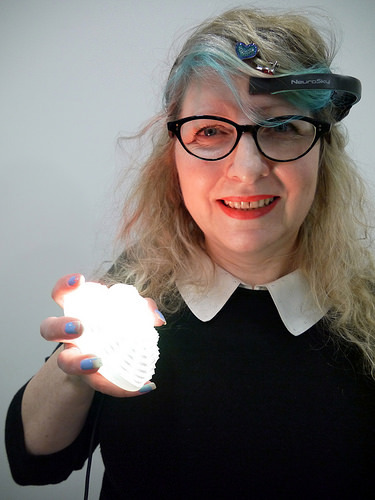 So, check out her beautiful AnemoneStarsHeart illuminated with the help of EEG data from her Bluetooth NeuroSky Mindwave Headset. 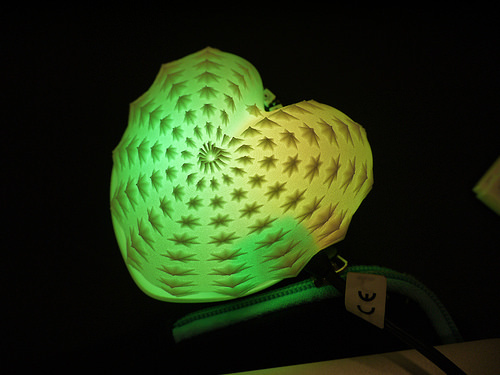 Rain hopes to use this as the next iteration of her EEG Visualising Pendant. It’s a shame that the medical field doesn’t use her flair for color and shape when it comes to testing. Patients would have a lot more fun. Okay, time to get started on your own 3D printed fashion. Renew your jacket with some Cyberpunk Spikes. They are printed with NinjaFlex and contain some sweet NeoPixel LEDs for flexible, night light fun. Your biker friends will be loving you.